"Reach Out –– Not Reach In"
Welcome to "Reach Out –– Not Reach In"
Reach Out –– Not Reach In! There have been hurt more times than I can even count. I had lost my second child, in May of 1982, to crib death. I cannot have anymore children, I have lost friends, family members to death and been abused so many times, by exe– husbands and those who had violated me, which led me to severe depression and being so distraught and negative about things in my life. I lost a wonderful dad, I was close to and my mother is 80 years old and it won’t be long until God takes her home. There are so many times in our lives we wish we could turn back time, but that is impossible to do, and we all know that, hurts that can really bring us down to our knees in dismay, and negativity that just bombards us till no end. One thing for sure, God can bring us out and up and He knows what He is doing, and we can overcome we just have to want to. And, I know I have and I never could’ve done it without God’s help. My mother she is still a widow and I have been by her side even before my dad died in April 2004. I have always cherished my parents, and was always there for them. No matter how many times we loose someone in our lives, husbands, sons, our family or even our friends we are to extend our loving kindness out to them. Especially, the widows we are to give them our kindness all from within, we are to always be by their sides. When we help other’s and show our love and kindness to them, it helps us overcome our hurts and our depression and those disappointments in our lives. There are so many people who are so down on themselves and feeling sorry for themselves that they seem to forget that there are other people who are out there who are going through the same thing as they are. If, we focus on someone other than ourselves and their pains it will help us out on our pain, it will help other’s heal and us also. 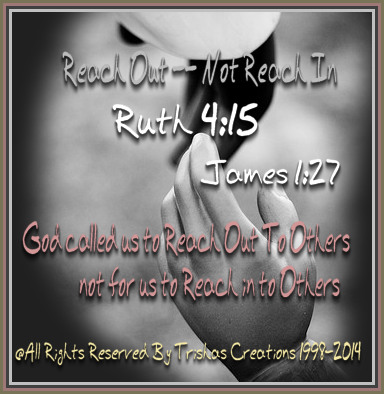 God called us to ‘Reach Out To Other’s” not for us to “Reach in to Other’s.” God can reach in to us and heal us, when we reach out to help other’s whom are in pain and are hurting from things that happen in their lives. God is the only one who can heal the broken hearted way better than we can do it by ourselves. Look at it like this, when you "REACH OUT" to other's you are also giving God a hand to help other's and be there for them , no matter what the reason's are. You are to show other's God's Mercy and Grace, we are to always lend a helping hand so, before you fuss gripe and complain, do the right thing and "Reach Out to Other's" and STOP Reaching In for someone to help you all the time, because when you do, the help will be brought to you. But, when you are selfish and uncaring then that's what you will end up experiencing from other's. So, if you are hurting and have lost someone –– reach out to someone else who is also hurting from something that happened to them, and God will heal you and them as well. Never just reach in and not reach out to someone in pain. That is selfish and God doesn’t want us to be or act that way! Remember, we are to "BE A BLESSING TO OTHER'S" not a infadel!